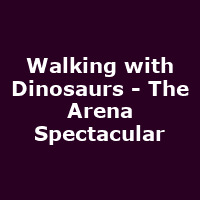 "Seen by over 9 million people in more than 250 cities around the world, WALKING WITH DINOSAURS - The Arena Spectacular, is back for 2018. Starring Michaela Strachan, be amazed and thrilled as the greatest creatures ever to walk the earth return before your eyes. The dazzling $20 million production features new, state of the art technology, making this the biggest and best dinosaur show in the world. Internationally renowned designers have worked with scientists to create 18 life-size creatures, including the Stegosaurus, Raptors, and the terrifying Tyrannosaurus-rex!"